5 concession stands around the main concourse level and a Full Service Food & Beverage Department by Savor...Pikeville. The Eastern Kentucky Exposition Center, Pikeville KY a SMG managed facility, is Eastern Kentucky’s center for culture, education and entertainment. 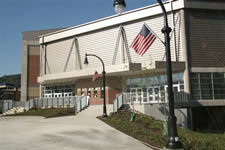 The Expo Center is the premier venue for entertainment and conferences and is located in the heart of downtown Pikeville. The Expo Center opened its doors October 3, 2005 and has since hosted a variety of acts and shows from Lynyrd Skynyrd, 38 Special, 3 Doors Down, Godsmack, Staind, Martina McBride, Larry the Cable Guy, Alice Cooper, Trace Adkins, Montgomery Gentry, Kid Rock, Hank Williams, Jr. and many more. Fans have also enjoyed a variety of other events such as Motorsports, Monster Trucks, Disney On Ice, Sesame Street Live, Lipizzaner Stallions, sporting competitions, regional high school tournaments, Mid-South Conference College Basketball Tournaments, conventions, graduations, proms, meetings and much more! For more information call 606-444-5500 or www.ticketmaster.com to purchase tickets. Book rooms today at the Brookshire Inn for special event pricing at 1-888-433-1107.